The coin honours the Universal Exposition EXPO in Milan. This ran from 1st May until the 31st May and had as its motto “Feeding the Planet, Energy for Life”. The EXPO in Milan was not intended to show achievements but rather to serve as a discussion forum dealing with the idea that all people have the right to adequate and healthy nutrition. Technology, Innovation, Culture and Creativity should all be combined in working towards this goal. The coin has a simple and very appealing motif. A semi-circle representing the fertile earth bears a tree from which sprout a grape vine, an olive twig and an ear of wheat. Also under the ground a seed ready to germinate can be seen. 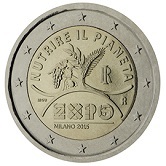 Around the top edge of the inner circle is the inscription ”NUTRIRE IL PIANETA” (Feed the Planet).The country designation, an I superimposed on an R is in the upper left quadrant and the mint mark stands at three o’clock. The initials of the designer are at eight o’clock. Within the semi-circle representing the earth EXPO and 2015 are shown superimposed on one another. Under these, separated by a line, is “MILANO 2015”. Return from Italian Commemorative 2015 to euro coin collector.